Yesterday we celebrated my son's third birthday with close friends and family. We had a nacho bar and a robot cake. I am exhausted, but he is elated! Lots of good memories made. LOTS of fun new presents to play with. As I was loading pictures this morning, it reminded me of his first birthday 2 years ago... when I loaded the pictures, and then looked at myself. As usual I was disgusted, but this time I was especially disgusted. 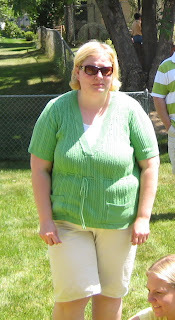 It was only 2 months later that I joined Weight Watchers... and well... you know the rest of the story. Yes that first picture is an actual picture from my son's first birthday party, and this one was taken yesterday. Sorry... I didn't happen to capture any full boy shots for a real comparison. But I will say... I certainly look a lot happier in the second one! What an amazing transformation! So inspiring to see that weight loss can really happen! You are beautiful!! Hugs! A lot happier, to say the least!